The wine is made from a blend of Montepulciano d’Abruzzo and Sangiovese. It spends a year in oak and six months after that in the bottle before being released into the market. I found it on wine-searcher for between $17 – $25 depending on the store. I thought it was a perfect wine for a meat based meal. I had it on Passover with Brisket which was divine but I can also see it with lighter meats or a pasta made with a heavy sauce. I’m very partial to Sangiovese as a grape, less so to Montepulciano but I did like the blend coming from this historic winery in Le Marche, a region I love. Villa Bucci is one of the more well-known wineries in Le Marche. It was started in the 1700s and the family has a very large agricultural farm that grows wheat and other products in addition to wine. They are most well-known for their Verdicchio dei Castelli di Jesi. They also make around 12,000- 15,000 bottles of red wine. 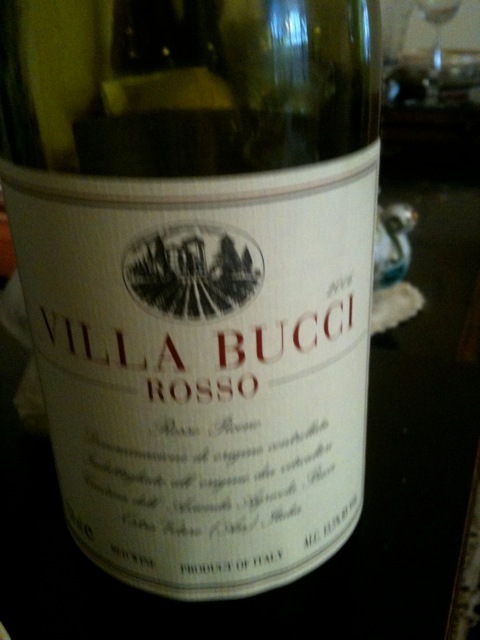 For more information on wines from Villa Bucci, check out their website: http://www.villabucci.com. An interesting post about the Villa Bucci Rosso Piceno. do you know the percentage of Sangiovese? I couldn’t find it on the website and since Montepulciano d’Abruzzo may have up to10 percent (I think) Sangiovese, I wonder what VB is blending. I look forward to trying this wine. Thanks for commenting. They have an older year on their website that says 70% Montepulciano e 30% Sangiovese. Where did you come up with the only 10% rule? Let me know. Now I’m quite curious. I admit that line of 10 percent came from the almost always right Wikipedia notes on Montepulciano d’Abruzzo, and Loren Sonkin – http://tiny.cc/pf0f8 – writes that Sangiovese is limited to no more than 15 percent and in Riservas are 90 percent Montepulciano and 10 percent Sangiovese, so I might have missed some boat completely. Eric Asimov, wrote this – http://tiny.cc/smy5h – in 2008 and it follows well on what you said above. Thanks Dave for straightening that out :).